I’ve written my “return to blogging” post in my head countless times in the last year or so. The trouble is, as I mentally write and rewrite it I can never figure out how to dive back in so instead I just don’t. But I miss writing and I miss being able to look back on here and see where our family was and what our lives were like. So here I am. No well thought out post. No fancy schmancy recap. No promise of when or if I’ll have a new post up again. But for right now, tonight, I’m back. To say it’s a major overhaul is an understatement. We are currently in possession of a wet saw rented from the Home Depot, a giant pile of dirt, and more landscaping materials and tools than I can keep up with. This project is such a beast and the weather has been so uncooperative that we’re having to divide it into 2 phases. Phase 1 will be done within the next month – Lord willing and the creek don’t rise. Literally. Phase 1 is the beds and grading of the yard to prevent water from standing and divert it away from the house. Phase 2 will take place early next year and will be the full sodding and irrigation project. I don’t know if this is really what you call it but hubby doesn’t have time to proofread so we’re going with it. When the improvements are finished, our yard will no longer become a pond in heavy rains. Instead, we’ll have a beautifully manicured lawn and I’ll have beautiful flower beds right off the front porch. I foresee fresh cut flowers filling out home daily and could not be more excited. What you might not realize is that in order to make this a financially viable project, hubby has taken it on 100% by himself. Thankfully, he has a degree in turfgrass management and a background in golf course work, everything from grounds crew all the way up to superintendent, so he’s well qualified for this undertaking. As we were rocking out to some Disney music the other night, the song “Just Around the River Bend” (Pocahontas) came on and ever since then I cannot stop saying that I have a handsome sturdy husband who builds handsome sturdy walls. I even told hubby that I don’t love him like Pocahontas loved Kocoum, I love him like she loved John Smith. I like to think he felt touched. The bummer of this whole thing is that hubby works full time. So, he spends his days in an office and his evenings/nights and weekends working on the yard. All while still making time to ensure the kids and I feel loved. That’s right, I said “kids”. Plural. Since I was last here, we’ve added to our family. He was born December 20, 2017. He was 8lbs 5.5oz and 21.5in. AG is his favorite person and he’s always got a smile for sissy. This handsome fella was a long time coming and we could not feel more blessed. AG had a Friday night sleep-over with her grandparents so hubby and I could go to dinner with other adults. It was a wonderful change of pace and we had a great time reconnecting with old friends and making new ones. Speaking of old friends… I work up at what can only be described as night time on Saturday morning to go yard sale shopping with one of my favorite people. We have been doing this on the first Saturday of October for 5+ years. (I really wish I could remember what year we first started.) I almost always end up with tons of great finds and this year was no exception. In addition to some smaller items, I came away with 2 very exciting things: I scored this brand new super plush rug that will go into the guest room when we get our new (much larger) one for the living room. And we happened upon an estate sale on half price day and I scored this new dining set! That’s a solid wood table with 2 leaves and 6 high cane back chairs! We are excited to sand these lovelies down and stain them a more fitting color for our home. I had intended to just leave everything as-is until I get the fabric to recover the seats and remove the back pads at that time. But, I brought in the first chair and could. not. stand. it. I removed the back pad off the first chair before I even brought the others in and it was like a breath of fresh air. I brought the others in from the deck and promptly removed all of those back cushions. I have no idea why the original owners would want those beautiful caned backs covered. It is like how you go into old fixer upper homes and the beautiful hard woods are covered in carpet. I have other higher priority things on my list right now but you better believe that the next free weekend will be spent making over this dining set. I was able to sell our old dining table, chairs, and slip covers the very next day and ended up $15 ahead; as long as you don’t count what I’ll spend on fabric and stain (which isn’t much). I think once we have this set fixed up and add a nice rug under the table, it’ll look great! It’s already an improvement over the old set. While we were yard sale-ing, it became clear the I was in need of a new battery for my van. Thankfully, it never died completely but it came close a couple times, so we just left it running as we hopped out to shop and tried not to go far. So, super fun stuff, I bought a new car battery after our morning adventure was over. Once my car was outfitted with a fresh battery, I loaded up AG and we headed to a neighboring town to pick up hubby’s new chair. You might remember the “lazy man chair” ended up hurting his back so we had to sell it and buy a new one. With all of the floor issues we had to wait to pick it up and the day finally arrived. I bribed AG with the promise of a strawberry milkshake at the farmer’s market in said town and we were off. As we were turning on the county road that the Ashley Furniture distribution center is on, I made an impulsive decision to show AG where cotton comes from. There was an awesome cotton field and I couldn’t resist but to stop and pick her a piece. The stems weren’t as pretty as what you see people decorating with (either it’s too early in the season for that OR they are buying fake ones) so I only got a couple for her. She loved it! Here’s my favorite quote: “Momma! This feels like real cotton!” Yes. Yes it does. After a hard earned milkshake (and ham sandwich and tomato bacon pie, ahem) we were on our way back home. It’s only a 45 minute drive so it wasn’t bad. It’s just far enough to keep me from getting fat on daily tomato bacon pie and milkshakes. Friday morning, I met with our flooring install guys. I also came home on my lunch break to check in on them and the dogs. All was well and to my great surprise when I came home from work that afternoon… Our new flooring was installed! What was expected to take 2-3 days was completed in ONE DAY! The new flooring is the same as what was ruined and we feel very fortunate that it was still available. We are currently hoarding quite a few extra boxes in our attic in case one day it is out of production and we need more. We were concerned that it would look too new where it joined with the old flooring at the hallway but that isn’t the case at all. It looks like it’s always been that way. Friday was a special day for another reason… my new best friend, Rosie, was delivered and I spent the weekend getting acquainted with her. She’s a Neato Botvac D85 and I LOOOOVE her already. I’ve learned a little about her in this short time we’ve been together and I’d like to share my knowledge in case you have your own robot vacuum or are in the market for one. – When Rosie gets tired, she returns to her home base to charge then she goes back out to finish the job. Sounds simple right? Well… IF she is in your way and you move her, then she gets all kinds of confused and acts drunk and starts walking into walls in an effort to get home. I was happy to learn that this is normal behavior and if you just let her do her thing uninterrupted then she stays sober and is able to get back home just fine. – She gets stuck in random places. Because she can climb about an inch to clean a variety of surfaces, she climbed onto the granite under our wood stove and only managed to get a corner up before she became stuck and had to call for help. – They aren’t kidding when the instruction authors say to be sure you get everything off the floor before you start your vacuum. Rosie snuck into our bedroom because *someone* left the door open and, of course, she went under our bed and found the missing pull chain from our ceiling fan. Unfortunately, she is so nice and powerful that she sucked it up and wrapped it around her brush and promptly shut down and cried for help. It was an easy fix and hubby had her back on her way in no time. But he did call me while I was out yard sale shopping because he was concerned she was broken. – She does not like having a full dirt bin and will beep at you until you empty it. Her prissiness makes her fit right in. – She does an AMAZING job at picking up dust and dog hair – OH MY! Full disclosure – I would not have vacuumed yesterday. However, I turned Rosie on when we got home and when she finished her dust bin was full. Like, really full. I had no idea the floors were that dirty. She will be running every single day because of this. Hi friends! If you follow along on Instagram or Facebook then you know hubby and I spent a recent weekend out at the beach celebrating the fact that we have made it through 8 years without the need for police or lawyer intervention. Happy Anniversary to us!! We visited Panama City Beach and rented at a condo in the Emerald Beach Resort. It was very nice. Next year we are looking at a couple different resorts along the strip. Trying new places is something we both enjoy. We are always looking for fun new adventures on vacation. The view from our condo was beautiful! I loved staring out at the water in the morning while I relaxed on the sofa with my coffee. Who would’ve thought that I’d end up being the early riser in our marriage? We took our Chromecast with us and I would watch Parks & Rec (again) on Netflix while I waited on hubby to join me. It was a much needed break from any responsibilities. It’s worth mentioning that our hotel had a nice little bar in the sky-walk connecting the resort and parking garage. This bar was decorated with all manner of Auburn decor (which I LOVED) but there was NO ONE there to watch the game. Ok. Maybe there were about 4 people. But it was decorated like a serious party. I was all exciting thinking there was some sort of an Auburn club meeting there to watch the game, but no. We never found out why they were so festive in their decor. This was our first visit to PCB and we needed to get to know the area. We figured it was best to take a scenic drive before sunset. While driving around we saw a billboard for a country saloon called Tootsies. We both love country music so we clearly had to give that a try. It turned out to be in a very nice area and was SO MUCH FUN. I danced for hours and we even made new friends. Then, the band played one slow song and I was done. I started falling asleep on the table so it was time to call it a night. Sunday was a day of recovery and re-hydration from the excessive dancing. We spent the afternoon playing out at the beach and hubby even got to show off his skim boarding skills. I was so nervous because I just knew he was going to end up in the ER. But my nerves were for naught because he was really good. I was of course super impressed. I’m kidding. And if you believed me for even a second then you clearly don’t know me at all. That’s our new friend Kaylee. She was basically the toughest girl ever. I just took pictures and clapped a lot. Sunday ended with music videos and a failed attempt at watching The Goonies. Someone fell asleep. Maybe the same someone who fell asleep in a dancing establishment the night prior. Monday was fantastic. We went shopping for a while which was so fun. I got 3 new necklaces and a scarf because eventually it will cool off. I have faith. After shopping, we stopped by Diego’s Burrito Bar and had the best food. It is a Chipotle-style place where you get to customize your meal. I ate my entire [ridiculously sized] plate of nachos and groaned the whole way back to the hotel whilst talking nonsense about never eating nachos again. I’m pretty sure I was in some sort of nacho-induced coma because what we did the rest of Monday is fuzzy at best. Best I can remember, we went to the beach where I was happy to rest and do absolutely nothing. Hubby got bored at some point and went back inside while I relaxed on the beach a while. Monday night we went to a nearby golf course and played night golf! I didn’t even know this was a real thing! And in all honesty, I was expecting glow in the dark balls and something along the lines of cosmic bowling with black-lights. In reality, it was a normal par 3 course with lights. My idea is genius and if you create it please let me know so we can come play. I’m terrible at golf and play so rarely that I have no interest in improving. I can (usually) hit the ball and then I am allowed to pick it up and drop it by hubby’s ball, or wherever I feel like it. These are what we refer to as booby rules. On this particular day, I actually played by standard(ish) rules for the majority of our time on the course. I even hit a few good shots. As I walked barefoot through the course I just kept saying “this is so much fun!” I never would’ve thought I’d have so much fun golfing. We are already planning to do it again next year. Only I’ll bring my clubs so I don’t have to rent. The next thing we knew it was Tuesday morning and time to head home. I will leave you with these travel words of advice: Stay somewhere with a bellhop. It’s spectacular and now I’m spoiled. I’ve been an official, out-of-college, adult for over 8 years. I’d like to share something new I’ve discovered. Hold onto your hats, this is a good one. It’s worth it to decorate and accessorize your home. It’s worth the money. It’s worth the time. It’s worth screwing up and doing something you end up hating to learn from your mistakes and find what really works. I always wanted our home to be beautiful and inviting and warm and cozy and all the things people want for their homes. For some reason I never could bring myself to spend the money and time and energy to make it happen. When we were first married, funds were very limited so extras like a pretty accessory were not happening. Even if it was only a couple dollars, I would say “no” to it because it wasn’t necessary to our daily life. Y’all, we didn’t even buy paper towels during this time so how could I justify a pretty new frame or decorative anything? Eventually, our income grew, as tends to happen over the years, but my frugal-to-a-fault mindset didn’t budge. I still struggle with this today. But something did happen after the flood. 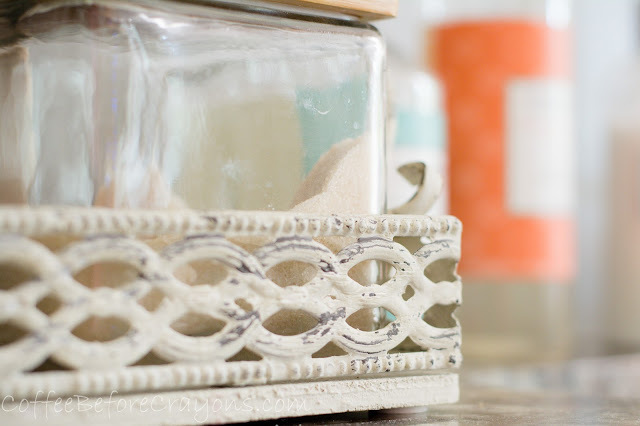 I started blogging and reading blogs and I naturally gravitated toward blogs about budget home decor. 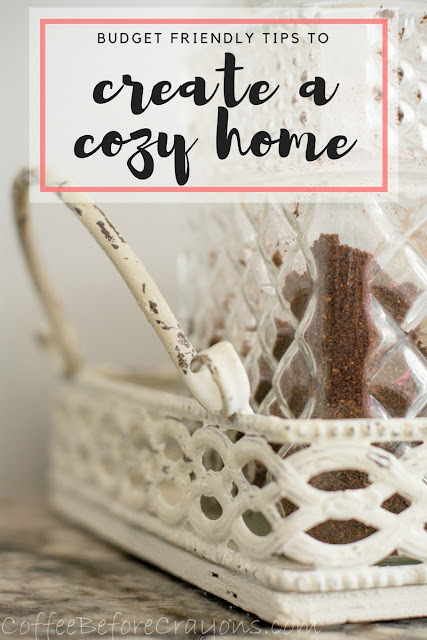 I started sharing things I liked and ideas I had with hubby and he told me how he wanted our house to be well decorated and cozy. It was such an exciting conversation! This is exactly what I needed to hear. I also wanted free reign over our home’s interior – this is still a work in progress. He really has great ideas and vision for our home too so I *usually* like to have his input. Honestly, sometimes it would be much easier if he were one of those husbands you hear about who lets his wife make all the decorating decisions without providing any input. But easy isn’t always best and I like knowing that he both notices and appreciates my efforts in making our house a home. I’m starting slowly with this new mindset and as much as I want to see our whole home done, where is the fun in that?! I’m going to embrace this journey from house to home. I’m starting to see the homey-ness already. After dropping AG off for her first day of Kindergarten *sob*, I went to brunch and HobLob with some of my best gal pals who also happen AG’s besties’ moms. Coincidence? I think not, The Lord works in mysterious ways and I’m so thankful he brought us together! We shall call them “The Moms”. Anyway, The Moms and I had so much fun shopping together. I got some cute things for our home and maybe a couple scarves and a gift or 2 for AG to celebrate her first day of big kid school. 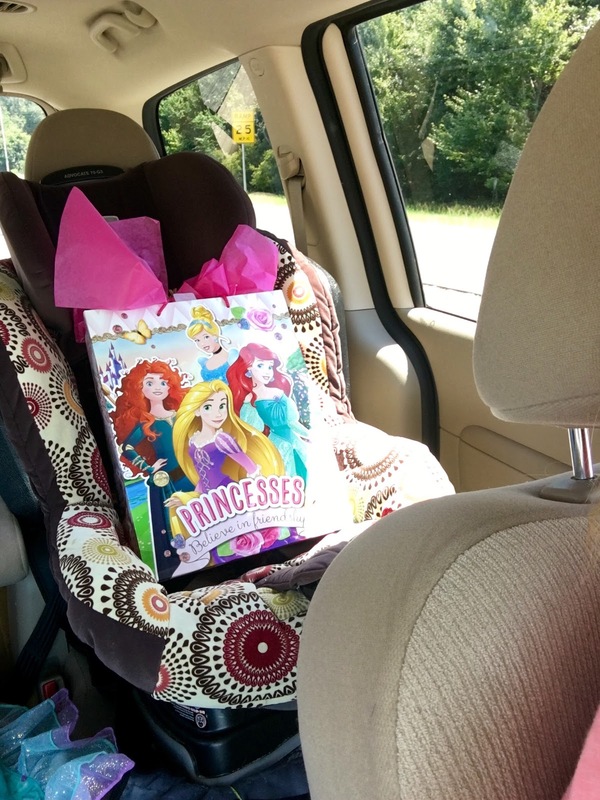 Shout-out to whoever gave her this gift bag at her birthday party last Saturday! I’ve already reused it 3 times. One of my new items was this woven tray. I knew right away it was exactly what I wanted for our remotes. On a previous trip to HobLob, I picked up the metal orb (which I adore! This one is similar) and the white vase with green plant. I wouldn’t have even thought to put them on the table except that our bookshelf had been cleared off when they relocated it to remove our baseboards and these, along with other bookshelf contents, were lounging in their new residence on our bar. 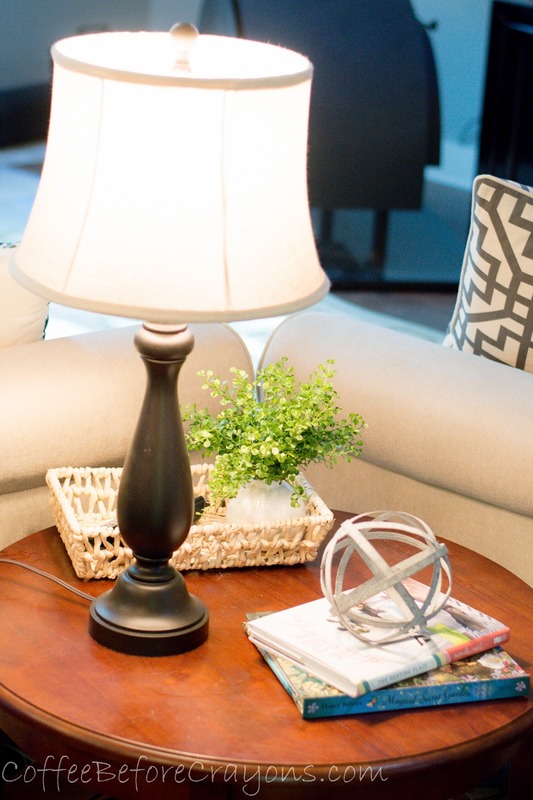 I read somewhere (probably Pinterest) that to decorate most any surface you need 3 elements: a lamp – check, a green plant – check, and a stack of 2-3 books with an object on top of them – double check! This is so true and I didn’t actually remember having read it until just now, sitting here, looking at the table in all it’s cuteness. I think an important element to a cozy home that is often overlooked is adding textures. There’s something about having interesting patterns and textures in a neutral color palette that is so inviting. I’m still wanting to paint this table but can’t decide on the color. Perhaps I should take my own advice and stop being scared to fail and just do it because really, if I don’t like it I can repaint it. The other item I scored was this tray that is perfect for our coffee area! 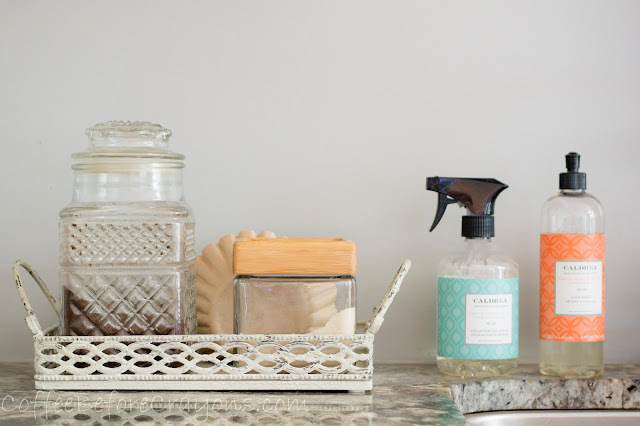 You won’t believe this part and I shouldn’t tell you but I’m going to anyway… I found this cute little tray tucked under some things in the clearance section. It was part of their Spring collection and when I took it to the register, it rang up less than $2! You can imagine my delight! Moral of that story: pay attention to the tags and how they relate to the current seasonal merchandise at Hobby Lobby because they don’t always mark every single item down. They are human and miss things here and there and you might score a great deal if you pay close attention to details. As you can see, I still struggle with loosening up the purse strings when it comes to “extras” for our home but I am slowly getting better. I don’t think I’ll ever be one of those people who can walk into Pottery Barn and pay full price for something just because I like it. Though I certainly like to pretend I am when I visit their website. Theirs and Restoration Hardware – swoon! The fact of the matter is, I have a deep seeded need to save money and live frugally. I also love a good challenge and, for me, part of the fun of decorating our home on a budget is the thrill of finding something great for a fantastic deal. This seems to be trendy these days and for that I am grateful. One last thing friends, I’m serious about painting that table. By all means, please leave me some ideas of what color would look best in the comments! Bear in mind that the living room rug will be changing soon. I’m trying to convince hubby that a natural jute rug would be best in here but he isn’t feeling it. So far, we’ve been able to agree on a medium gray with a slight pattern. I’m feeling like that might be too much gray with his gray chair (coming next weekend!) Time will tell.